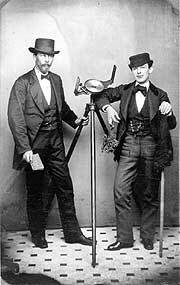 Tintype of a surveyor and chainman with a vernier compass made by Levi Colton, taken around 1870. Catalog #1985.0181.01. The surveying and geodetic instruments in the National Museum of American History reflect the importance of these activities in America since the first European colonists settled here some 400 years ago and turned the American landscape into property. With these instruments, and others of their ilk, Americans determined the limits of private and public lands, the paths of transport, and the boundaries of colonies, states, and nation.